17th edition include updates on extensive coverage of the War on Terror (executive discretion on latest Guantanomo case in Chapter 6; update on decisions involving congressional civil rights enforcement power; the latest First Amendment cases involving "fleeting expletives" and religious monuments in public parks; updates on campaign finance (plus look at "millionaire exception"); voter identification requirements; and the right to bear arms (Second Amendment) individual right (Heller). Kathleen M. Sullivan is professor of law at Stanford Law School and the author of articles on a wide range of constitutional issues, including affirmative action, abortion, freedom of religion, and freedom of speech. 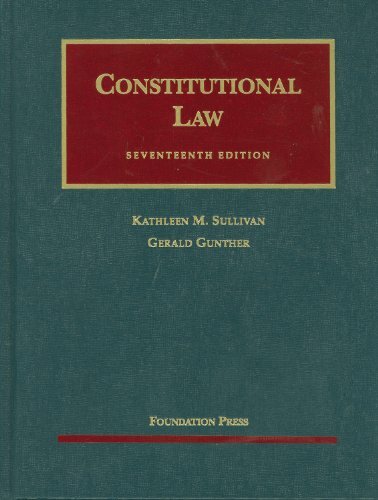 Gerald Gunther is William Nelson Cromwell Professor of Law, Stanford University, and the author of "Constitutional Law, " 7th-12th editions, and "Individual Rights in Constitutional Law, " 1st-5th editions.